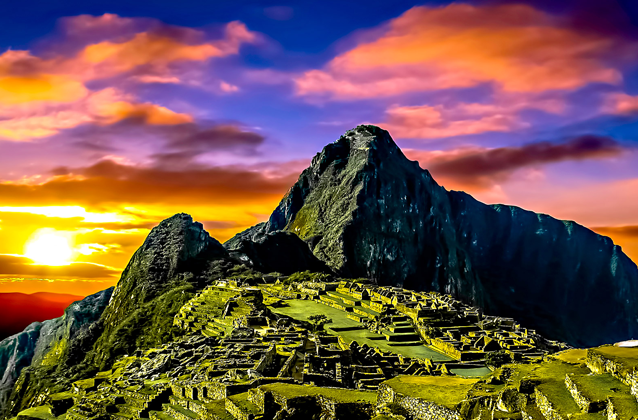 The Inca Trail is the number one trek in South America and is rated by many to be in the top 3 treks in the world. This shorter version of the Inca Trail still allows you to visit the most beautiful ruins along the way to Machu Picchu, Winawayna. Enjoy lunch before visiting and then continue through the Sun Gate for your first view of the Lost City of the Incas. You will continue down to Aguas Calientes village and have dinner at the best restaurant in town before heading to bed. For those who want a small taste of hiking the Andes, this 1 day hike with the next day spent at Machu Picchu can not be beat. • Bus down from Machu Picchu to Aguas Calientes on day 1 and 2 (If you get tired, you can purchase the bus on the spot for $12 usd). Hike from Machu Picchu to Aguas Calientes is 1 hr. You must buy Huaynapicchu tickets separately. Huayna Picchu is the mountain that stands next to Machu Picchu. It is a 45 minute hike to the top. This is done after your tour of Machu Picchu. The Inca Trail to Machu Picchu is rated moderate and any reasonably fit person should be able to cover the route. There are some challenging moments and altitudes of 4200m are reached, so ensuring that you are well acclimatized is important. If you are arriving from sea level, plan to spend at least 2 full days in Cusco prior to commencing the trek. You will be picked up from your hotel at 4 a.m. Following, we will go to the train station and leave on the 6:10 a.m. train, from Ollantaytambo. The train follows the Urubamba River, until we reach Km104, where we'll begin our trek. Along the way, you will see spectacular views of the farmlands, snow-capped mountains and the mighty Urubamba River, one of the sources of the Amazon River. At 104 km (2,000 m), we will begin our trek. Once you have everything you need, we will provide you with a packed lunch, energy drinks and take a group photo, before visiting our first Inca site. After an orientation and tour of the Inca site, we will begin hiking upwards, as we head for the Classic Inca Trail. If the weather is clear, we'll have tremendous views of Machu Picchu, the Urubamba River and other surrounding Inca Sites. A big advantage of this hike, is that by the time we reach Machu Picchu, most of the day travelers will have returned home, so you will have the area to yourself. After taking photos, we will go down to Aguas Calientes and head to your hotel. Following, we will head to a restaurant for dinner. After dinner, we recommend going to bed early to make the most of the next day. • All reservations must be canceled in writing and are subject to a cancellation fee. • If you cancel or change the date of your tour with 10+ days of advanced notice, you will incur a $400 dollar cancelation fee per person. • If during the length of the program, a traveler abandons the excursion due to altitude, health, or for any other reason, no reimbursement will be made and no claim accepted. • You agree to cover all expenses made by you due to abandonment of the tour such as meals, hotel, return transportation, medical expenses, etc. • It is compulsory that all clients have personal travel insurance. This insurance must cover personal accidents, medical expenses, loss of property and all other expenses which might arise as a result of loss, damage or injury occurring to the client. • Certain Services might be interrupted or even canceled due to weather conditions, natural disasters or other disturbances such as civil unrest, worker strikes, etc. In the case the tour is canceled for your safety, we will work with the appropriate suppliers to obtain a refund only when those suppliers agree to do so.